When people talk about Jason Miller, they invariably mention three things, in varying order: his wit, his youth, and his meteoric rise in the burgeoning United States design scene. Though all of these qualities do belong to him—Miller is funny, young, successful, and (as if it were anomalous) a Brooklyn resident—he is also pragmatic and serious. And if there’s a lot of noise surrounding him and his studio, he doesn’t hear it. 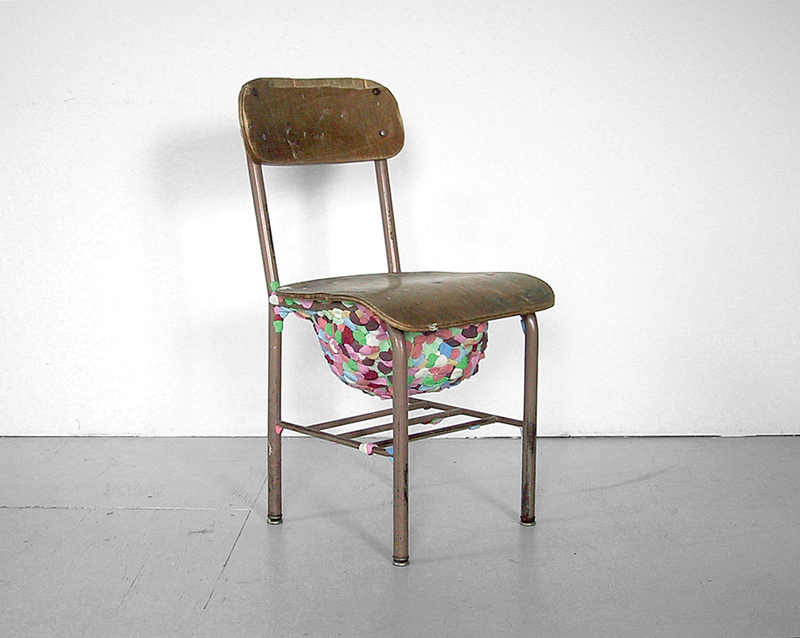 For the exhibition “Repair Shop,” ten designers were asked to repair a salvaged chair; Miller contributed this piece, entitled “Kids Have No Respect”. More anomalous than imperfect, Miller’s terra-cotta “Whatever Pots” are cast from objects one would use if one didn’t have a planter, like his “Lots of 2 Litres” planter. 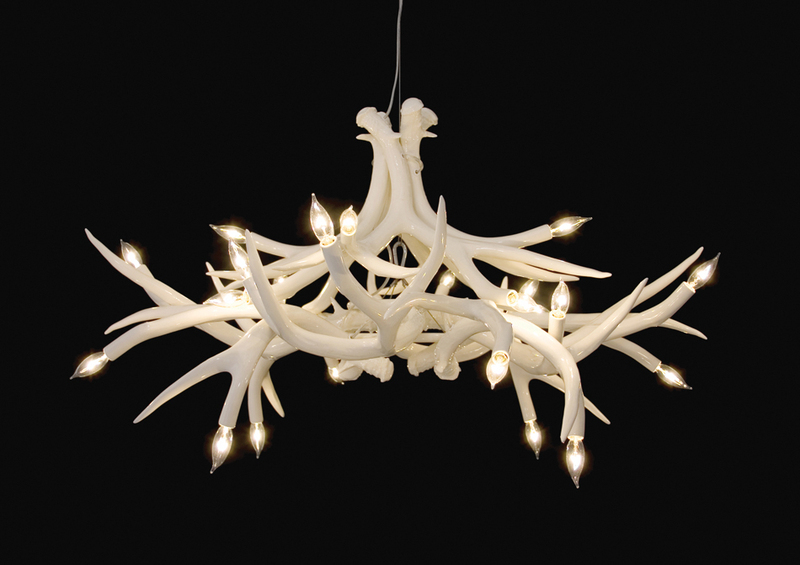 Miller’s Superordinate Antler Lamps are the refined alternative to the velvet covered, parasite infested, natural ones (though we like those too). 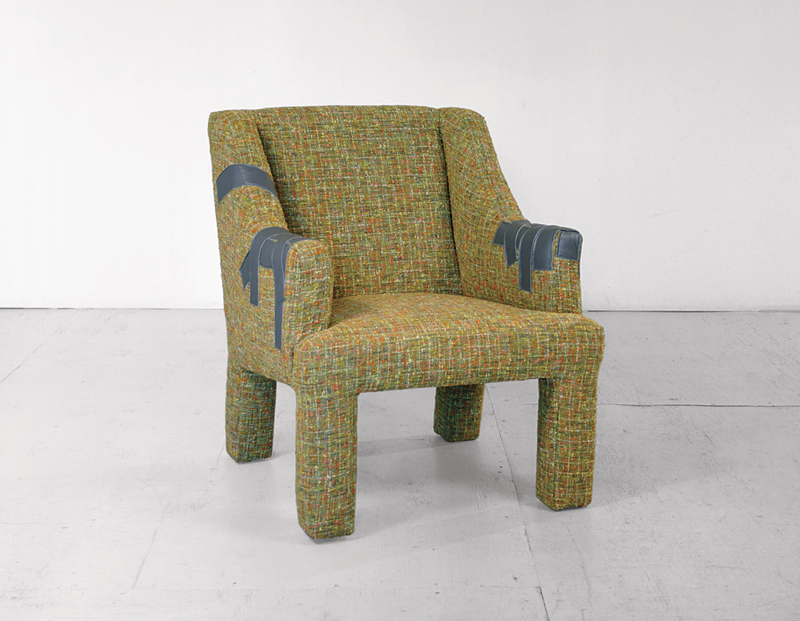 Miller’s Duct Tape Lounge Chair is an homage to imperfection, loosely based on that sad lounger from college days, when furniture was found, bought, and repaired for little. Miller’s chair, however, is structurally sound; the duct tape is upholstered leather. The “CPU Table” is from his “Wire Tables” series. For his Seconds series, Miller played off of the idea of irregular products being sold as “seconds” for a lesser value; the Full Tea Service highlights irregular patterns and misplaced motifs. The Daydreams mirror is a reverent departure from the designer’s interest in imperfection. A designer of “not art” objects, Miller dismisses perfection as a Sisyphean goal, opting instead to make quirky, concept-oriented design. His sagacity and self-possession make him a formidable conversationalist, particularly when it comes to his work; he is reluctant to accept others’ opinions of his designs and seemingly references them only to make a point. Yet for all his confidence and particularity, he possesses the same disarming, scrappy charm apparent in his work. So, let’s cut to the chase: Do you feel responsible for the antler thing? [Laughs.] You know, I’ve been asked that more than once, and everyone phrases it in the exactly that way—as if it’s my fault. What’s the problem with the antlers? Nothing. I actually have a set of real antlers at home, but they were inspired by your fake ones. But aside from spurring a major trend, you’ve also enjoyed decent exposure at shows in galleries and museums across the country. Do you have a sense of your increasing notoriety? Being in the [Cooper-Hewitt, National Design Museum] triennial was great. And I’ve done some shows at galleries around the county. I just did one in Houston and one in Denver, but I show up for the opening and then I leave, so I don’t know how people take it afterwards. I get some sense from sales, because they trickle down to me at some point, but I don’t really get a real sense of how it’s received. Let’s just say the PR in my office is very manageable. Do you feel that design is getting greater exposure and respect in the United States? Yes, but we’re still way behind. It’s hard to judge by Brooklyn because I think it’s disproportionate to the rest of the country. And Brooklyn is a pretty small scene compared to Amsterdam or Stockholm. To me, what’s interesting about Stockholm is that I actually think the design is quite boring, but it’s integrated into the society in a way that whatever we do here in the States is not. There aren’t fancy design stores in Stockholm, which is interesting because there is fancy design—it’s just sold in regular stores. It’s still separate here in the States. There still has to be that special place where you can get “design stuff.” And that’s indicative of our having not really integrated it yet. We’re probably better off than we were ten years ago, but design is still not a part of everyday American life. Are you happy to have not gone to school for design? There isn’t much I feel I missed. And I think I’m a better designer based on the route I took [which was to study painting in graduate school and then go to work for Jeff Koons and Karim Rashid]. What’s good about art school, and what’s interesting about people making art, is that they have to think about why they’re making everything. They don’t need to just solve a problem; they need to figure out why they’re making it and what that object means in the world. Design schools don’t teach you that. They teach you how to design things, how to solve problems—but they don’t teach you why. I’m really glad that my education was the former and not the latter. I don’t like to call my work art, and I don’t think because there’s an idea behind it, that makes it art. You’re going to be living with this thing no matter what, whether it solves a problem or not, so it might as well have a good presence; it might as well add something, not just be able to keep your magazines off the floor. We have things that can do that, there’s no reason to make another one—it has to offer more. So that’s all I’m trying to do, to give it something else. Well, if it’s not art it’s certainly more conceptual than a lot of objects being produced in the United States. Do you feel marooned? I think there is more space for it. But I’m still on the fringe. My stuff doesn’t sell particularly well, with a few exceptions. The U.S. public hasn’t quite accepted design, or rather, a certain type of design. But I don’t necessarily think there’s anything wrong with being on the fringe—in a way, I sort of have to be here. While I’d like my pieces to be mass-produced and marketed, I’m not operating in that world. I’m creating objects that are expensive because they aren’t produced in large numbers and they aren’t simple to make—they are not consumable on the same level as [pieces from] IKEA. I think that an independent designer has to operate in this place, because if you’re making the same thing as IKEA, you will lose every time—it’s just not viable. What is your opinion of IKEA and its design collaboration, like the PS series? Well, the alternative is that they just rip it off. So, of course, I support it. I mean, anyone can make a Hella Jongerius vase. Don’t get me wrong, I love her—but it would be easy to knock off. IKEA has historically tried to bring better-looking objects to the masses—it’s nothing new. The only American equivalent would be, maybe, Target. Is it? I mean, everyone says that, but what are they doing? Target feels to me that they’re using [good design] as a marketing idea more so than IKEA—and maybe that’s because I don’t see Hella Jongerius on their TV ads. It’s easy to say that Target is the company in the United States that’s promoting designers in a way that no other major company is; I’m a little dubious about that. And one could also argue that the designers they choose aren’t wanting for exposure. So, you were saying “jewel-like”? [Laughs.] I had a high school teacher, Mr. Levine, who said, “If you can’t make it good, just make it big and paint it gold.” I think that was actually pretty good advice. Of your work, do you have a favorite thing, say, other than the antlers? 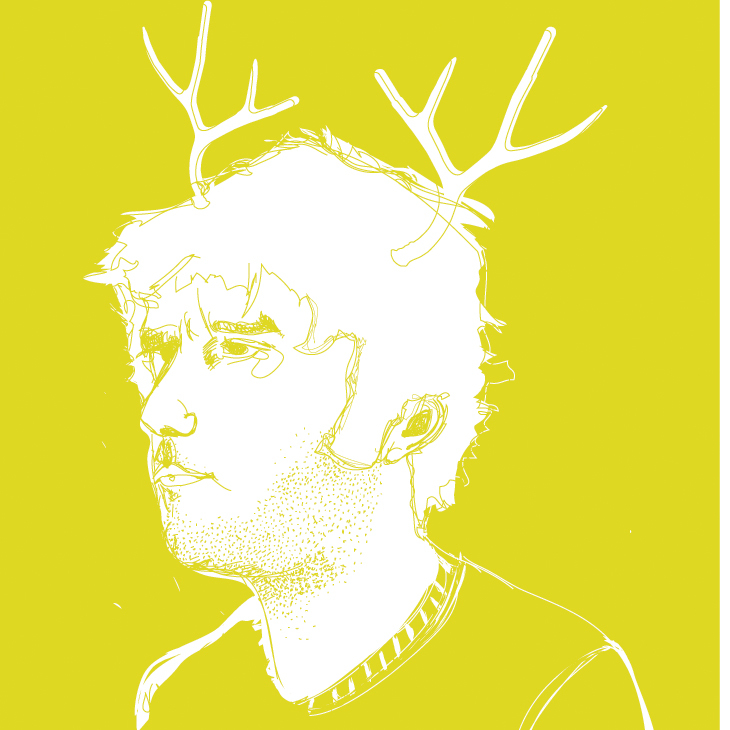 First of all, it wouldn’t be the antlers. It’s hard to say. If I were to pick two, I would say the Daydreams mirrors and the Duct Tape chair. Well, the Duct Tape chair is the best example of an idea that I worked with for two or three years—the idea of imperfection—and that project summed it up for me. I should say, also, that it’s imperfection as a virtue, not as a problem. I like the Daydreams mirrors because they’re outside of that concept, and I like promoting them because I don’t want to be pigeonholed as the guy who makes messed-up stuff. That aside, I really do like them as a project, because it created a new type of object. It’s not just a mirror decorated with something, it’s actually a new type of mirror. I remember my older brother’s mirror that said “Styx” in a sparkly, hologram-like font. Yours is subtler. The technology for those things comes from bar mirrors, so a mirror that says “Styx” is likely produced with the same technology, just pushed a little further. In that way, I was able to create something more ethereal and more like a design object than a cheesy novelty good. Are you concertedly trying to get away from this “guy who makes messed-up stuff” idea? Yeah, that was the thinking for Milan [furniture fair]. I mean, it’s not a total departure. I don’t like things that are perfect. I think it’s a silly goal—an unachievable goal—but there are ways to achieve [the idea]. There can be other types of anomalies, not just problems. Do you have any cult followings or a concentrated fan base in, say, Japan? In terms of countries? Oh yeah, Japan seems to really like my stuff. That would make a great pull quote. Europe doesn’t seem to like it at all—you can pull that. And how would you characterize U.S. design? I think what’s interesting about American culture, in general, is that it tends to be pragmatic and it tends to be all-inclusive. It’s really hodgepodge. There isn’t that direct cultural lineage that a lot of other countries have. Sweden would have a really hard time getting past their design history. It’s hard for a Swedish designer not to make something out of blond wood. They might say that they want to, but it’s really hard for them not to. We are much more free to do weird stuff. The flip side of that is that I think American design tends to be crass; we’re not very good at making pretty things. Again, there are exceptions—everyone’s favorite example: the iPod—but I would say, in general, crassness is a quality of American stuff. Would you like your work to be prettier? Is that something that interests you? It doesn’t interest me at all. What I would like to do is to be able to be okay with making crass stuff. Yeah, I think so. I have made some ugly stuff before. To see more images of Jason Miller's creations, please visit the slideshow.